This is one of my favourite topics to talk about, so much so that I am overly excited in my chair at the moment to share it with you. It’s about hair! Changing your hair colour or hairstyle can honestly make the biggest difference to your confidence. In my opinion, it’s that best attribute that divides you from everyone else and gives you your own self-identity. I am here to talk to you about the newest fashion trend but this time for your hair. I know what you must be thinking “WHAT? 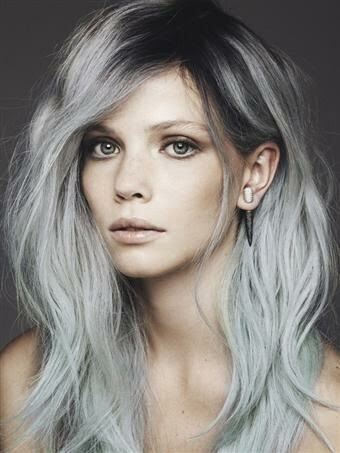 GREY HAIR IS IN STYLE?” Yes, it’s in style and it’s amazing. I’m excited to talk about grey hair being in trend for this season because I myself am currently rocking this hair trend. I know eventually in the future we will all get a full head of grey hair but the fun part about having it now is the amount of styling you can do with it when you’re young. You might be wondering if having grey hair would make matching outfits together harder? Well, it doesn’t. Matter of fact, it actually makes all your outfit stand out more because your hair becomes the centrepiece of your entire look. My personal favourite way of styling my grey hair is by pairing darker colours on top and lighter colours on the bottom, this causes a great contrast for your hair against your clothes. So do you dare to be a little edgy and try out this hair trend? Send us tweets @ElgibleZine and @Christineewong if you would and show us if you did! Yes grey hair is crazy but considering your outfit color coordination, I can see how that would stand out. Starting with light and shading to black or darker colors.. love it, and your enthusiasm carried through well in your writting.